WordPress is one of the most popular blogging platforms and content management systems today. Given the immense popularity, every web host provides an easy way to install WordPress. 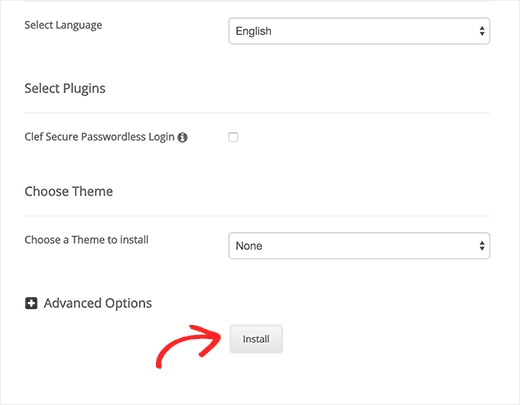 The following sections describe how you can perform a one-click WordPress installation from within your cPanel for Inmotion Hosting server. You don’t need to copy files manually, set up a database or deal with complex configuration, the entire installation process only takes a few minutes. While the details might vary for different hosts, the basic steps remain the same. In addition to a good web host, you will also need to have a domain name before proceeding with this installation. Click WordPress under the Scripts section. 3. The first section is the Software Setup. Choose a protocol – HTTP or https, depending on whether your site has SSL support. If you are not sure, go with the default (HTTP). Enter the directory name where you want WordPress to be installed. By default, WordPress is installed under the domain chosen in step b i.e. example.com. In case you specify a directory name e.g. 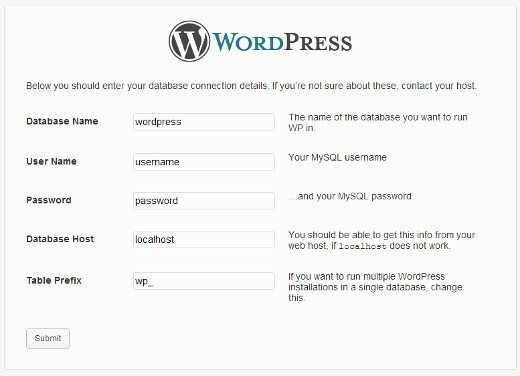 mydir, the WordPress files will be installed under example.com/wordpress. Enter a database name e.g. dbtest1. The database is a storehouse for WordPress to maintain all your website data. Its unlikely that you will be using this again once your WordPress is installed, so pick a name and move onto the next step. 4. Next section is Database Settings. WordPress stores information related to users, posts, comments, etc using tables. You have the option of keying in a suitable prefix for these tables e.g. test1_. By default, the prefix “wp_” is associated with the tables. 5. Moving on to Site Settings. 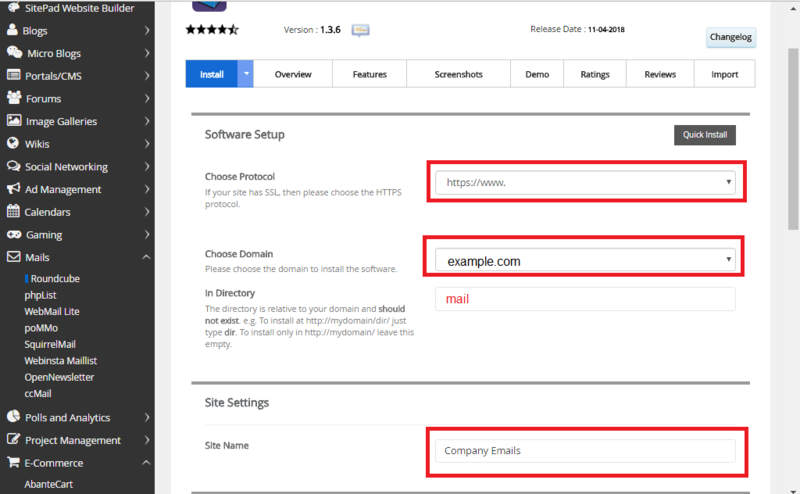 Enter the Site Name and Description that will appear on your WordPress site. By default, cPanel uses My Blog and My WordPress Blog respectively. 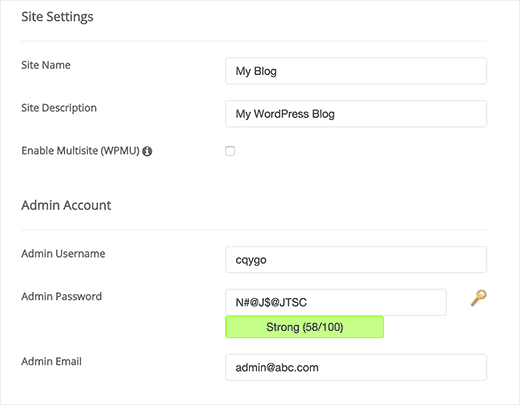 WordPress Multisite (WPMU) is a mode that will enable you to create multiple sites on a single WordPress installation. It is ideally used for large websites (e.g. universities) having a lot of content, often separated in sub-sections (e.g. colleges, majors, honors). Check this box if you want to enable MU for your WordPress installation. 6. Lastly the Admin Account section. The admin user will have all the privileges required to maintain the WordPress installation. Avoid using the username ‘admin’ as your admin username. This, coupled with a weak password, makes it very easy for hackers to break into your admin account. Hence it is imperative to choose the right admin name and a strong password to protect your WordPress account. You can now access your WordPress site at – http://test1.blgvt.com. The administrative URL is http://test1.blgvt.com/wp-admin/.